Technical Car Experts Answers everything you need: BMW 330Ci 2000 Convertible system parts and removal? 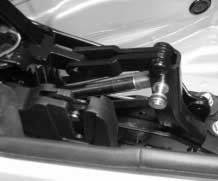 BMW 330Ci 2000 Convertible system parts and removal? Most likely there is a leak in one of the many hydaulic lines for the top. Usually the hydraulic fluid has a distinct smell, with the top partway open try to smell around the left and right well areas of the top for any funny smell. Or look for any shiny looking area and this will be the area of the leak. The bad part is that the top needs to be removed completely to replace any lines that are leaking. Carefully detach lower soundproofing sheet towards bottom. Carefully pull away upper soundproofing sheet at line side (joint) sideways and then remove towards top. Installation: Opening must be located over plastic retainer . ELECTRO-HYDRAULIC FOLDING TOP PARTS section are the main cylinders. Labels: BMW 330Ci 2000 Convertible system parts and removal.